Progression in video games comes in three varieties. “Player” progression refers to the person playing the game improving their skill and knowledge of the design. Many action-based titles are designed around the player getting better at the game to have any chance of winning — a big example being the Souls series. “Character” or “Abstracted” progression refers to the in-game avatar becoming stronger outside of the player’s skill. RPGs are the best example of this, and the whole abstract concept of leveling up. The final kind is “game” progression, and that refers to moving through the various levels or areas of the game until you reach the credits. Depending on the design of your title, you may have any combination of the three as the focal point. The important part is understanding what progression means to your title and to the people playing it. A good progression model motivates the player to keep playing; no matter if they’re winning or losing. Nothing stops someone more from playing a game when it feels like they’re not making any progress, or they’re losing it. Even if the progress can be measured in centimeters, as long as they’re moving forward, the player will still be motivated. When we talked about the concept of grind in a video game, I mentioned that a game becomes a grind when progression is no longer working. Another point is when a game makes use of persistent systems that are required to actually see the end of the game. The player should always have a chance at winning, and not have to grind runs until they’re at the point where they can attempt the real thing. Another aspect of progression is that the player needs to see something for their hard work. There must be growth represented in-game for the progress to matter. We could talk about the game becoming easier due to skill, getting new armor with abstracted or just seeing “stage complete” for game. Looking at the idle/clicker genre, this is one of the major reasons why they’re so addicting to play. The player is always seeing some kind of progression. Even without adding in new game systems, the simple act of having numbers go up gives the player a sense of progress. With that said, let’s talk about Graveyard Keeper and why it didn’t work for me. 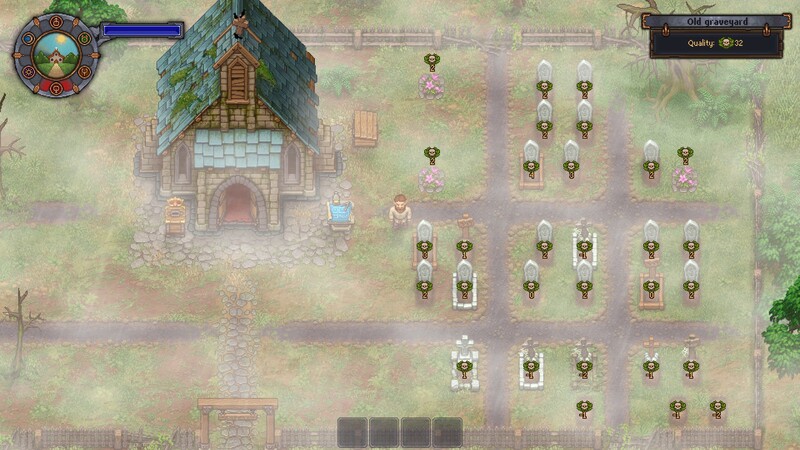 Graveyard Keeper has already received several patches with quality of life features, and there is a chance that some of these concerns are not relevant anymore. With that said, from playing the game, I found that the whole progression model has the stick, but not the carrot. The entire game is built on unlocking new things to do, but not necessarily making it easier or more interesting to play. The various NPCs you run into have tasks, but instead of rewarding the player with a new feature or reward, tasks usually just lead to more tasks. The one positive compared to their previous game Punch Club is the fact that you do not lose experience or levels when not in use. Again, the player should never feel like they are not making progression or failing behind. One of the worst examples of this lack of progression comes in the form of upgrading the church that helps earn the player money each week. The game tasks you in the beginning to raise 20 silver (money is in denominations of copper, silver, and gold) to upgrade your church. However, the player’s reward for completing that task is to then be told that in order to use their upgraded church, they must now raise an additional 20 silver and without the use of the church to help with collecting the money. Instead of the player’s functionality growing while playing the game, it just feels like they’re adding more work to be done. This is a stark contract compared to Stardew Valley, that allowed the player to have big upgrades to their farm or character as the game went on. A good progression model is vital for maintaining the player’s interest. When they work, you can have a game that keeps people coming back for hours on end, but without it, they may not want to come back after a play. Whether you’re working on an idle game meant to be played for minutes, to a 100 hour + RPG, you must have your progression model fleshed out. And as one final point, you need to aware of any “pain points” in your design — or when the progress intentionally or not slows down. We’ll be talking about that in an upcoming post and why it is often one of the biggest problems of Free to Play Design.